Nuno Mariz has created a very detailed post with step by step instructions on how he created a Lifestream for his own site using the FriendFeed APIÂ client and the Django code framework. One of the unique aspects of his project is that he is also archiving the data. You can view the finished product on his Lifestream page here. 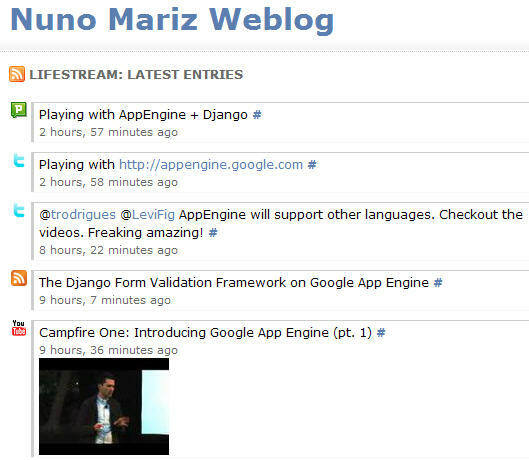 His site also offers other Django tips and information.Â I see on his Lifestream that he is already playing with Django on Google’s shiny new app engine. That is an amazing lifestream!!! Thanks for sharing! I never tried this one before. Thanks for sharing it with us.